We’re on our third country garden now. Our first two gardens had to look good all year round. The entire garden could be seen from the house. This time we have areas that look good at specific times of the year and we have developed wilder areas well away from our home. Over the years we have progressed from a tiny plot to a medium garden and now we are lucky to have a lovely large country garden. We love it here and so does the local wildlife! Here’s my Garden Studio and the Spring Garden. To have a really good look at the wood, meadow and duck pond we have to take a short walk through the rest of the garden. It’s great to have space to develop areas for particular seasons and specific uses. I’ve designed the garden so it’s divided into distinct areas so it’s very easy to maintain. The Gravel Garden faces south and is full of grasses and perennials. The path to our front door is lined with lavender and scented herbs. On a warm day this garden is simply buzzing with bees and butterflies. In autumn we leave the seed heads on most of the plants so that ladybirds and small insects have food and shelter for the winter months. The Summer Border (below) is right next to the house so we can see it from the windows. When the summer flowers are long gone and the summer scheme is well past its best this border is still on show. It was important to make sure that some of the plants look good all year round. There’s a permanent framework of flowering shrubs and I’ve included evergreen box topiary and a yew hedge as a backdrop. 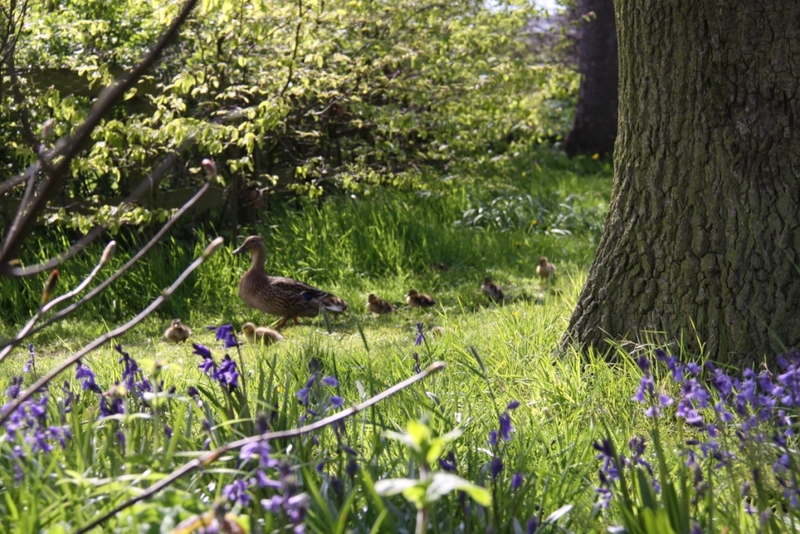 There are mature trees in our garden, English Oak, Beech, Horse Chestnut, Sycamore and Hornbeam which form a mini woodland we call the Bluebell Wood. When the trees are in full leaf in summer and autumn little very little sunlight can penetrate the canopy and reach the ground. Any plants which need sunlight to flower in summer and autumn have no chance of surviving here. It’s a different story during winter and spring. The leafless branches mean that every sunbeam can reach the woodland floor. It’s a perfect place for bulbs to grow. They make the most of the available light by flowering well before the trees have leaves. We have Snowdrops in January and Crocus in February, Daffodils in March, Bluebells in April and May followed by Martagon Lilies in June. Most years we just mow the central area of the wood. We’ve found that leaving the grass around the trees where the bulbs are helps wild flowers to flourish and provides hiding places for wild animals. This has to be the ultimate low maintenance garden. Bulbs are brilliant! In summer our herb garden is in shade for part of the day. There are several really good herbs that grow well in shade so we makegood use of those. The garden is edged with chives and golden oregano. Where there are any gaps I plant salad. I love the cut and come again varieties such as oak leaf lettuce . Mint grows really well in shade and there are several good varieties we grow. I love the variegated pineapple mint. We also grow lots of parsley and sage for cooking and I always plant borage, nasturtiums and bright orange marigolds too. To add height and interest in the centre of the herb garden we usually grow a wigwam of sweet peas. Later in the day the sun reaches the herbs and the flowers attract bees, hover flies and other beneficial insects. At the bottom of the garden there is a large pond which has become home to a pair of Moorhens. They guard their territory fiercely fighting off other Moorhens and Coots to keep the pond to themselves. Only the ducks are allowed in. Mallards fly in daily from the neighbouring field ponds and in summer the females bring their newly hatched ducklings for their first dip. The duck pond is deep and made with a clay lining. Predominant plants are our native yellow flag iris, Iris pseudacorus, blue iris and various reeds. Wildflowers and grasses grow around the edge of the pond. It’s our favourite spot to sit on a summer evening. The Moorhens use iris leaves to build their nest and they make sure it’s well hidden. They hide from a heron which visits daily for a mid morning snack of fish or chicks. 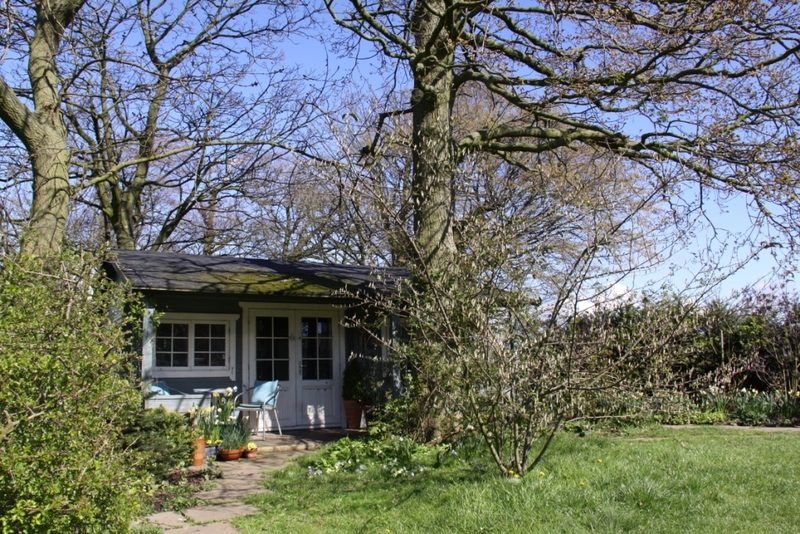 The Spring Garden wraps around my garden studio. 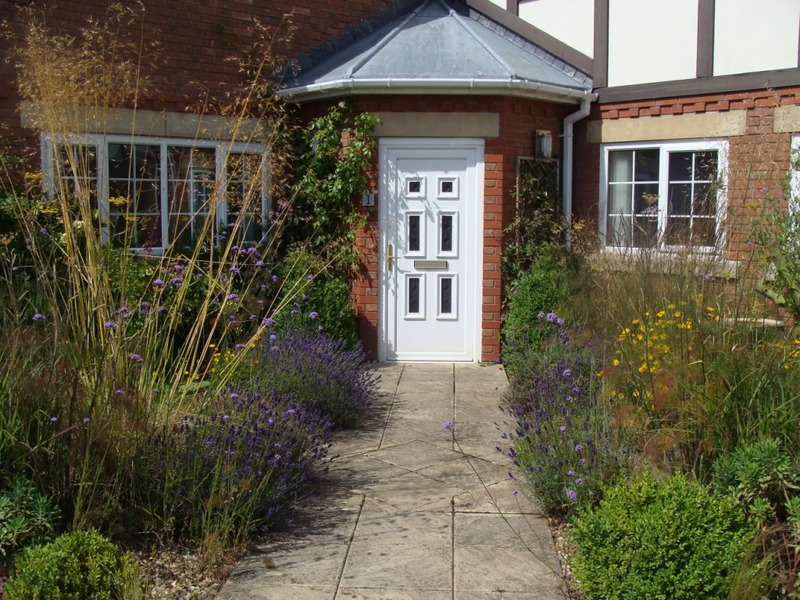 In places it’s like a traditional border with tall shrubs and early flowering perennials. Elsewhere it has a much more natural feel as if everything has slowly evolved and the plants have been there for ever… and some of them have. There are mature trees which were here long before we arrived and they are the reason for the Spring Garden. Their canopies cast deep shade in summer and it’s no good fighting against that. I’ve found that the best approach in shady situations is to grow plants which flower before the trees are in full leaf. We have chosen shrubs which flower in winter and spring, spring bulbs and early flowering perennials which can make the most of the early sunshine. There are patches of deeper shade… ferns and hostas are my secret weapons there. As a rule most plants with huge leaves have evolved to make the most of the available light. They are beautiful when fully open and even more fascinating when their squeaky fresh green leaves begin to unfurl. So that’s a quick walk through my garden to give you an idea of the layout. I hope you enjoy your visit to Country Garden UK. Please feel free to let me know what’s going on in your garden or ask questions via the comments box. A great, and detailed, introduction to your lovely garden. It looks great. We have recently moved to Suffolk to an old cottage with an overgrown garden which we’ve started renovating, I’ve a greenhouse being installed this week, my first ever, and I’m longing to see it built. My blog is https://mossfighter.wordpress.com/ and posts on my greenhouse and the renovation are on the Gardening page, please visit if you have time. Thanks for your comment Steve. Renovating a garden takes time and it’s thoroughly enjoyable. I bet once your greenhouse is up and running you’ll wonder how you managed without it. Gorgeous. I’ve resisted putting in a pond because the idea of plastic anything really squicks me. A clay liner … interesting. Before plastic and butyl liners were invented clay was the material used to line ponds. You have to puddle it in. For large ponds cattle were driven over the clay and the action of their hooves on the clay created a smooth surface that held the water in place. Today an excavator does the same job. All the farms around here have huge ponds and fishing pits made in this way too. If you have a band of clay in your garden then it’s the obvious choice. My whole garden is clay. ‘Nuff said. haha Thanks so much for this. You are welcome Debra. Good luck with your pond!